Whether it's for breakfast, a snack or afternoon tea, freshly-baked scones are hard to beat... unless you're comparing them to freshly baked scones with an amazing topping. Here's you'll find tips for which toppings to try with which types of scones, how to make your own scone toppings and more. Perhaps the most famous scone topping is lemon curd. This afternoon tea condiment can be purchased in many specialty food stores. 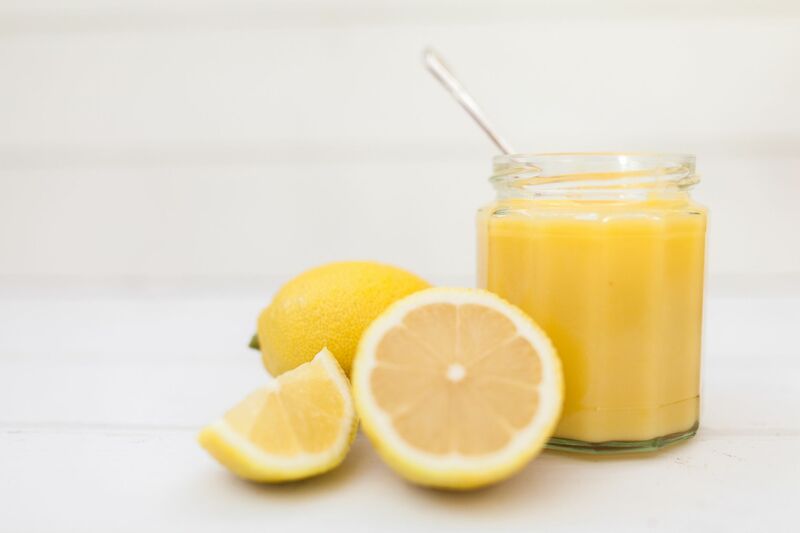 It's also fairly easy to make lemon curd at home with some basic culinary skills in place. Lemon curd is often paired with pumpkin scones. It's also wonderful with most fruit scones, plain scones, and white chocolate scones. Also known as Devon cream, Devonshire cream, or Cornish cream, clotted cream is an essential part of cream tea. It's often spread on scones along with jam, but it also works well on its own. Whipped cream is not just for pies, lattes and coffee cocktails. It's also wonderful on scones, especially fruit scones, seasonal fall scones, ​and chocolate scones. Topping scones with powdered sugar (a.k.a. confectioner's sugar) is dead simple and dang tasty, plus it works for pretty much any kind of sweet scone out there. Simply sprinkle sugar over baked scones with a mesh sieve (to ensure that the coverage is even) just before serving. Jams, jellies, and marmalades also make excellent scone toppings. Marmalades (which are similar to jams, but are only made with Seville oranges) are ideal for many dried fruit scones and citrusy scones. They also pair well with chocolate scones and plain scones. Jams and jellies come in a wide variety of flavors and can pair with pretty much any kind of scone out there. Also known as "compound butters", flavored butters are a secret weapon in the kitchen and a divine addition to the tea table. If you're hosting a more Eastern-themed tea party, throwing a party with lots of the color green, or simply serving a green tea that would stand up well alongside it, opt for matcha butter to top your scones. Its bold color and flavor are ideal for basic scones (such as cream scones) as well as many fruit scones and chocolate scones. When you use salt in place of sugar, it works well with many savory scones, too. You can also use other powdered teas in lieu of matcha for a different color and flavor, though many of these will be improved with the addition of more confectioner's sugar. When great fruit is in season, there's no good reason not to use it! Although they take some time to prepare, pureed or sliced fruit compotes add flavor and texture to scones, plus they often come in rich jewel tones that delight the eye. If you're looking for a simpler topping, go for sliced fruits. Usually sliced or whole berries (such as the sliced strawberries pictured on green tea cake here), sliced stone fruits and chopped apples with lemon juice (to keep them from going brown) are great bets... but there are plenty of others to choose from, too! As odd as it may sound, applesauce is a variation on a fruit compote. In a rush? Don't dismiss good quality applesauce as a potential topping! Like coffee, tea, and wine, honey varies enormously with where and when it was produced. Some honeys are thick and creamy enough to be spread over scones, while others are runnier and better for drizzling. Some are mild in flavor, while others are bold, with herbaceous, woody or even nutty flavors. If you have access to local honey varieties or to other interesting honeys, experiment with pairing them with scones. Herbed butter can go sweet or savory to suit sweet or savory scones. It's easy to make, yet it tastes like such a luxury topping that one might never guess how simple its preparation really is. There are plenty more ways to top savory scones! I recommend salted butter the most highly--it is a favorite for many. And then there's also mustard, finely grated hard cheeses, thinly spread fresh soft cheeses, homemade pesto, pickled pearl onions, relishes, gourmet pickles (diced), spiced fruit chutneys, horseradish sauce, sour cream, homemade mayonnaise and chopped fresh herbs (such as chives, basil or tarragon). Homemade chocolate sauce and caramel sauce are obvious picks. Nutella (and the many other chocolate-hazelnut spreads out there) are great choices for many scones, too. There are icings and glazes to consider if you want your scones to be sweet.